27 Members of the European Parliament have signed a joint letter warning the European Bank for Reconstruction and Development (EBRD) and Euratom to suspend the loan proceedings for nuclear units lifetime extension until a full transboundary Environmental Impact Assessment (EIA) and a public consultation are launched and carried out in accordance with international treaties to which Ukraine is a party. Lifetime extension of nuclear reactors in Ukraine – The EBRD and Euratom are co-financing the EUR 600 million Nuclear Power Plant Safety Upgrade Program to modernise all 15 of the country’s operating nuclear reactors. The reactors 1 & 2 at Rivne have already received a lifetime extension of 20 years beyond their 30 years design lifetime without the implementation of a proper environmental impact assessment (EIA) and a transboundary public consultation process in Ukraine and in neighbouring countries, as prescribed by the Espoo and Aarhus conventions, both signed and ratified by Ukraine and all EU countries. Although such conduct has been assessed by the Espoo Convention implementation committee as a violation of this international treaty, Ukraine does not seem to be approaching the upcoming lifetime extensions differently. “Spending millions of EU tax payer’s money on keeping open high risk and out-of-date nuclear power stations in Ukraine is utter madness. Ukraine’s nuclear authority (the SNRIU) has a record of ignoring safety risks and cannot be trusted. In 2013, the SNRIU extended the life of a reactor in the South Ukraine Power Plant until 2023, despite independent studies showing that safety limits have been breached by up to 10 times the acceptable levels! With war still raging in Ukraine, the EU approach to extending the lifetime of nuclear power plants in the country is like having a sword of Damocles hang over the heads of all European citizens”, said Dario Tamburrano, Member of the European Parliament (EFDD, Italy). 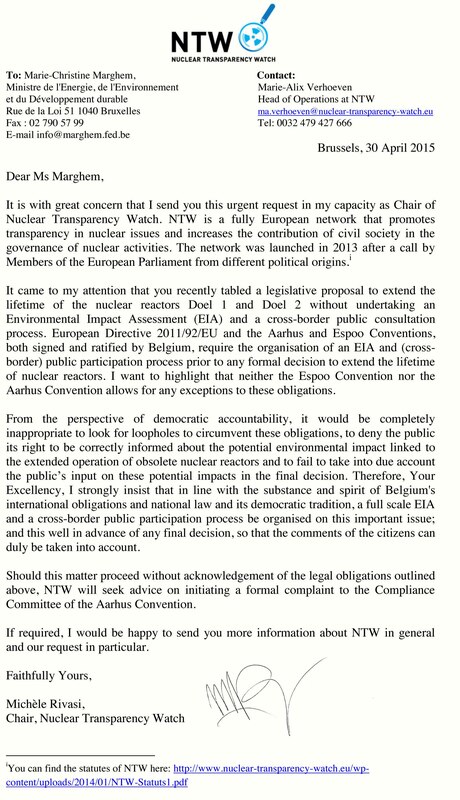 A joint letter from MEPs – Since this is the matter of European safety, adherence to EU, international rules and transparency, Members of the European Parliament (MEPs) are convinced that all EU policy makers should be informed and take action. At a meeting with campaigners from CEE Bankwatch Network and Nuclear Transparency Watch (NTW) yesterday in the European Parliament, MEPs from six political groups have decided to join the call for freezing the loan proceedings until a proper transboundary EIA and public consultation are carried out. The joint letter signed by 27 MEPs has been sent today to the representatives of EBRD and Euratom. “Euratom and the EBRD are also committed to apply the principles, standards and procedures established by international and European laws, namely the Aarhus Convention, the EU Environmental Impact Assessment Directive and the Espoo Convention. When tax-payers’ money is not used as it should have been, we must suspend payments. EU institutions should make sure that rights of its citizens are fully respected. The prolonged operation of nuclear reactors implies an increased risk of a severe nuclear accident with potentially devastating impacts on the environment and the people “, said Michèle Rivasi, Chair of NTW and Member of the European Parliament (Greens/ALE, France). Ukraine is not the only country in this situation – Several European examples show that more has to be done to promote increased transparency and strengthen international rules on subsidies in Europe. In Belgium, the legislative proposal of the Energy minister to extend the lifetime of two 40 years old nuclear power reactors breaks the Espoo and Aarhus Conventions by ignoring the right of the public to participate in an environmental impact assessment and a public consultation involving also the neighbouring countries. Another example is Austria, where the government has the intention to take the commission to the European court of justice over state subsidies for UK-based two nuclear reactors at Hinkley Point. These subsidies – which Austria considers to be competition distorting, illegal state aid – are to be funded through levies on consumer bills. On 7 April 2015, the French Nuclear Safety Authority (ASN) has released first information about the manufacturing defect found on the top and bottom caps of the EPR reactor vessel under construction at Flamanville. More detailed information have since been provided by an information note from the ASN published on 9 April, by a briefing dated 12 April from WISE Paris and an opinion of the Institute of Radiation Protection and Nuclear Safety (IRSN) published in the press on 3 April. As presented in the opinion of the IRSN, the technical aspects of the case confirm at this stage the seriousness of the problem: – The caps have a manufacturing defect that hasn’t been observed before in the existing reactors in France, – This defect originates from a carbon segregation, which was expected by the process of change selected by the manufacturer and was measurable from the stage of manufacture, – This segregation, exceeding the standards applicable for these parts, leads to lower toughness values than the general regulatory requirements, past or present, as the specific technical requirements for the EPR project. Under these conditions, the qualification of the cover and the body of the vessel can come only from another justification from Areva in order to comply with the prescribed standards based on the act of conducting new tests. This demonstration is particularly crucial to the vessel body, which was set up in Flamanville and which would, in practice, be very difficult to be replaced. Finally, the handling of this case has a strong international dimension, since many pieces produced for abroad EPR reactors are concerned. While some pieces are offered for Flamanville-3 qualification needs, others are already in place on the EPR reactor being built in Taishan, which poses a consistency challenge between China and France. Regardless of a necessary clarification on failures that led to this late detection of the problem, ANCCLI highlights the importance of examining the vessel qualification case in exemplary conditions, for at least three reasons: 1) The case has definitely a national significance. The EPR under construction at Flamanville is the seed of a new model of which the objective was, from the beginning, to present an important step in terms of safety. In the post-Fukushima context, this objective must remain the benchmark for assessing the robustness of the vessel; 2) The examination of this case finds itself under a strong economic pressure, given the interests at stake on completing the EPR itself and the international implications for the nuclear industry. For providing all necessary guarantees, the process must be subject to an exceptional effort in access to information and participation; 3) As pointed out by the IRSN, the offending parts diverged significantly from the area known for the materials of existing vessels, which makes it more difficult to produce a justification for their mechanical strength to an equivalent level of guarantees. The novelty of this technical problem calls for the mobilization of a pluralist expertise. To address this issue to the needed exceptional level under conditions of confidentiality and serenity of the examination, ANCCLI recommends the establishment of a pluralistic group of experts dedicated to examine this case. This kind of device has proven in the past to deal with matters that, even if the topics and contexts were different, had the same needs of response to complex problems and situations. Also, ANCCLI offers ASN to explore as soon as possible the possibility of setting up a pluralistic group of experts (its mission, its composition, its effectiveness within existing processes) and on the conditions of access to information and participation associated with this specific process. The next few months should be put to good use for the set up of this group and its capacity to review the results of new tests conducted by Areva, when these one will be available. ANCCLI shall put itself at the disposal of ASN to contribute to this debate. The Association Nationale des Comités et Commissions Locales d’Information (ANCCLI), (National Association of Local Information Committees and Commissions) is a national association in France that brings together the local bodies that have been set up with the dual roles of providing information and oversight of nuclear installations. martial law in our country. However, martial law is not entered. The IP addresses of BelaPAN’s websites belapan.by, belapan.com and naviny.by were blocked on December 20th. It is still unknown who did that and for what reason. However, it is clear that the decision to block the ID addresses could only be made by authorities as in Belarus the government has monopoly on providing IP addresses. BelaPAN had not received any official warning or notification about the coming blockage. The new amendments to the Media Law, which allow the blockage of websites, will come into force only on January 1st 2015. In this regard we view the blockage of the IP addresses of BelaPAN as a gross infringement of freedom of expression and media freedom in Belarus. We are taking all possible measures to obtain exhaustive information from government agencies as to who made the decision to block our websites and on what grounds.